Dr. Massoume Price: Why We Have Fish For Nowruz? Fish as a significant symbolic entity has a long history in Mesopotamia, where they believed that the earliest civilization was formed by men who came out of the sea in form of fish. There are also fish-like creatures that often appear as protectors in mythologies. In Iran, fish as a symbolic creature is documented from the 8th century BC, in Elam. Currently, there is an object from Susa (Shush) at the Louvre Museum known as the Spinner. The small object shows a high-ranking woman seated on a ceremonial stool with lion claws, specific to divinity or royalty. She is spinning wool, and in front of her there is a food container showing fish, and behind her there is a standing female attendant fanning her. This is not a domestic scene; the woman seated is either a goddess or a high priestess in a temple, or a royal princess in a palace. The spinning is ceremonial. High-ranking women used to weave ceremonial luxury cloths that they dedicated to temples or to their husband king/royals. This scene shows some sacred act, and that is why it is carved in the first place. The fact that there is a fish here, means there is some significant symbolism associated with the scene. At this point, we do not know this symbolism, because the other half of the object, the part that shows who this female is paying respect to, is missing. The fact that a goddess, a priestess or a princess is shown indicates some association with fertility, and even maybe some connection with the celebration of the New Year, often linked to fertility and procreation. In the Achaemenid era, 5th century BC, the fish shows up again. Amongst the Oxus Treasure objects at the British Museum, there is a hollow gold fish with a hole in its mouth. This has been used for oil or perfume, very likely during some rituals. Such expensive luxury objects when made were usually associated with divinity or royalty and had significant symbolism. Again we do not know the symbolism of fish from this period. We have more information from the Sasanian era, particularly the 7th century. In a book called Bundihshn (the Foundation of Creation) we come across the Zoroastrian Creation Myth of the 7th century. It is here that we have more information about the fish. Nowruz itself is based on the Zoroastrian Creation Myth from this period. In the Creation Myth described, Nowruz is the first day when the cycle of life starts. On the whole this myth describes the first 7 creations, sky, earth, water, first plant, first animal and the first human, and sun/fire together. The myth also explains the cosmic battle between the good and evil and names creatures involved. It is a long story, and if one looks closely at the Haft Sin spread, one will see all the 7 creations (and their protectors; the 6 Holy Immortals or Amesha Sepanta and Ahura Mazda symbolized by fire/candle). In Bundihshn chapter 2, fish represents the last and the 12th constellation called Mahik (the Fish). Mahik also appears at chapter 14, on the Nature of Animals, which mentions that fish were created of ten species and names them. In chapter 27, on the Chieftainship of People and Animals, the Kar-mahi, or Arizh, (also called Kara-mahi) is the chief of the water-creatures that fights sea demons in favour of Ahura Mazda (Lord of Wisdom), in the original cosmic battle against the forces of Ahriman in a mythical ocean. In short, fish has both celestial and mythical importance being part of the creation myth. There is a plate from the Sasanian era at the National Museum of Iran that is believed to show a spring/Nowruz scene. We can see the fish here as well. Also almost all countries that celebrate Nowruz, have a fish-dish for Nowruz. This certainly is not a coincidence, considering fish has not been the most common food in most of these countries. The fish-dish is probably a celebration of Kara-mahi and its role in fighting the demonic forces of Ahriman and also a symbol of the first animal. 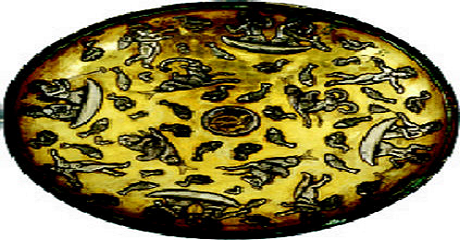 The same way other Haft Sin items symbolize the act of creation and its main elements, plants (flowers and green shoots), animals (fish), people (egg), water, mirror (sky/heaven), soil in the potted flowers (earth) and candles (fire/Ahura Mazda).